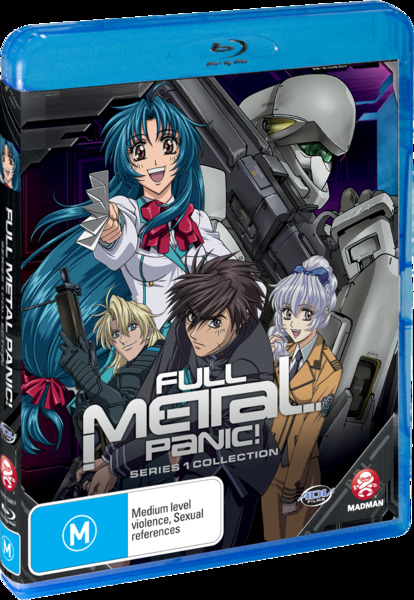 Based on the popular light novel series of the same name, the anime adaptation of Full Metal Panic made its debut on Japanese screens in 2002. A clever fusion of mecha, military intrigue, drama and high school romance, the series revolves around popular 16-year-old student Kaname Chidori. Unbeknownst to Kaname, a group of terrorists secretly covet the young lass and are plotting to abduct her, believing she possesses the rare and arcane abilities of ‘the Whispered’ – abilities they intend on putting to nefarious use at the earliest possible opportunity. Sousake Sagara is a teenage sergeant sent to infiltrate Kaname’s high school and protect her from the clutches of any underworld rogues. He doesn’t exactly blend in seamlessly with his fellow students however, and the constant friction between the pair and their complex, difficult relationship gives the series much of its dramatic impetus. As the narrative unfolds the terrorists’ reason for wanting Kaname are slowly exposited, Sousake’s true mission is revealed and an evil nemesis, without which no series of this ilk would be complete, rises up to challenge Sousake and Kaname with his army of mechanoid killers. The intermittent flashes of comedy and romance become less frequent and the story takes a much more sinister tone as, finally, the young pair find themselves fighting for their lives against a seemingly unassailable opponent. Full Metal Panic rises above the sum of its admittedly dissimilar parts and produces a rich and surprisingly cogent viewing experience. The action for the most part bubbles along at a nice pace, the relationships are left intentionally ambiguous and the plot expands nicely over time. The three-disc Blu-ray set is a handsomely appointed one, comprising all 24 episodes of the first season and several extras, and although the series suffers from the occasional lapse into repetition (always a danger with a series of this length) it ultimately proves a nuanced and deftly engaging adaptation of the Shoji Gatoh source material. The series is almost a decade old and shows its age in places, even on the up-scaled format. There are no artefacts to speak of but the image is comparatively soft throughout. The colourification is strong, however, and overall the visuals hold up fairly well – just don’t expect the perfection of some of Madman’s recent HD outings, such as Akira or Samurai Kings. On the audio front both a Japanese TrueHD 2.0 and an English TrueHD 5.1 surround soundtrack are on offer. I won’t indulge in my usual rant about the wisdom of an inferior mix in the anime’s native tongue, especially since ‘inferior’ is a relative term in this instance. Both are clear and solid, with the Japanese having the superior voicework, as ever, and the English track slightly enhanced dynamic range. A 23-minute interview with author Shouji Gatoh, who penned the stories on which the series is based; some fairly novel Japanese piracy warnings, original TV spots, textless openings and closings and six trailers.